Workers across the country cheered the news of the tanker contract win. 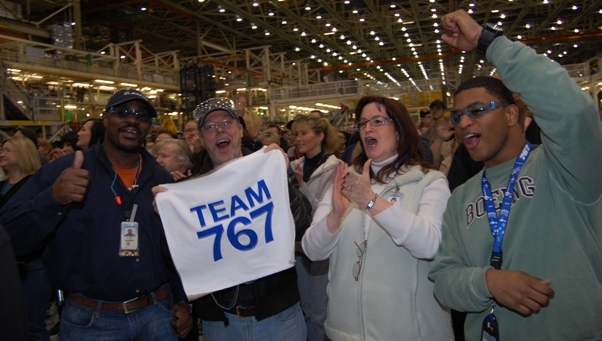 From left, John Jenkins, Gary Ottinger, Janis Tawrel and Josh Allen join the celebration on the 767 line in Everett, WA. The news that Boeing won the U.S. Air Force contract to build a new fleet of aerial refueling tankers is a big triumph for the IAM, who has fought nearly 10 years to help bring this award to fruition. And no where is the win more evident than in Washington, Kansas and Connecticut, where 50,000 jobs – existing and future – were on the line. At a time when aerospace workers have been hit harder with layoffs than at any other time since the Great Depression, IAM members and their communities are savoring the taste of victory. In Kansas, Boeing Wichita will be the finishing center where IAM District 70 members will convert the jets into tankers, and members at Spirit AeroSystems will build the forward section.